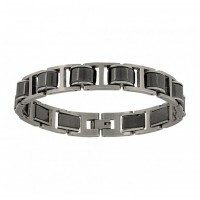 A smooth finish stainless steel bracelet with interior charcoal colored links. 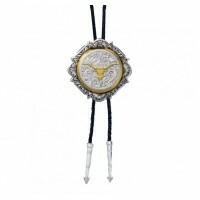 Latches with a clasp that retains the pattern of the bracelet. 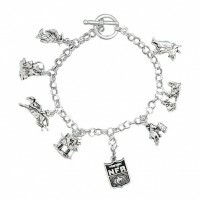 This bracelet is rugged yet polished enough for a evening out. 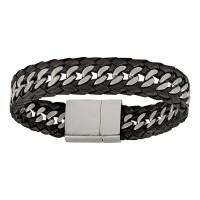 This stainless steel and genuine leather bracelet is one of our newest additions for men. The braided leather binds the linked stainless steel along the edges, forming a rugged tread-like design. Fastened with a magnetic slide clasp this bracelet is easy to wear. Total length is 8.5". 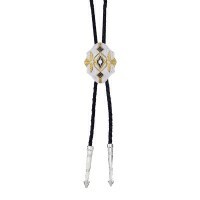 Beautiful for both casual and formal wear, the traditional western silver filigree engraving of the tall scalloped slide on this bolo tie is accented with gold and black geometrical patterns, feathers and fans in the Southwestern style. Hand painted. 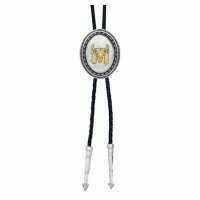 The black braided leather cord is nicely weighted with two silver arrow pointed tips.